So this past week I had off for the holiday and spent most of my week at the Jersey Shore better known as my home. I ate great meals here and there (some places I may speak about speak eventually) and then before I knew it, it was Friday and I would be heading back up to North Jersey during the weekend. So I made sure I ended my stay at the Shore right and ate at my two favorite places and had food & possibly drink comas that day & night. Since my plan was to go out with my former roomie and best friend that night (my next post) I decided to sacrifice not having a cocktail with lunch in order to stuff my face with Japanese goodness. It was a lunch date with my mom and since I wouldn’t know the next time I’d be home I thought it was worth it to go and have a hibachi food coma and have her experience my favorite place as well. Customer Service: 5- I’ve never had bad service at Ikko. They are super attentive and the guys behind the sushi bar are always nice and personable. My boyfriend and I know some of their names because we were such loyal customers when we lived closer. The wait is never too long and they run the business very well. Atmosphere: 5- The atmosphere is fun, traditional and maintained well. You have plenty of your own space too. Food Quality: 5- Their sushi rolls are nothing short of amazing, when I go with my boyfriend he usually gets the spicy tuna roll, we split a California roll, and my personal favorite is the Shrimp Asparagus roll. They also give you a complimentary small plate/appetizer so you’re not starving before your sushi is served. I’m always intrigued by their dishes. The hibachi is just as good and it’s a huge portion. I always have leftovers and they taste even better the next day! Price: $-$$- Two hibachi lunches was less than $25 dollars when I went with my mom. If you love hibachi it’s a huge bang for your buck. 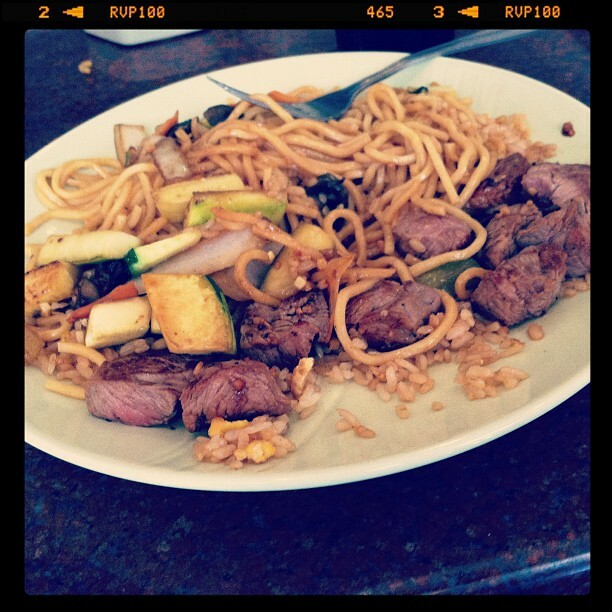 The hibachi lunch includes soup, salad, rice & noodles, your hibachi of choice with veggies, and ice cream. My boyfriend and I have never spent more than $30 on our sushi dates which usually include: 1 miso soup, 1 green salad, and 3 rolls with soft drinks. The hibachi dinner is a bit more pricey but it includes everything from the lunch and a shrimp appetizer but it’s totally worth the money. It is BYOB which isn’t a bad thing, especially because you’ll be stuffed– I always have hibachi leftovers! Final Score: 15/15- As mentioned above– the food is on par and prices are great. Why worry about alcohol when you can have a food coma? Lunch is definitely more of a bang for your buck so if you’re taking a beach break check it out or go there for a post beach dinner. Ikko is a hometown favorite of mine and has a huge place in my heart and stomach, there is only one IKKO. Ugh, now I’m craving a Shrimp Asparagus roll! This entry was posted in deals, hibachi, japanese, nj, Small Chick Big Deals, sushi and tagged Ikko, scbd by smallchickbigdeals. Bookmark the permalink.